* 3 minutes walk from the bus stop where you could take bus to any scenic spot, airport, railway station, bus station etc. * Fresh seafood BBQs, Parties, etc. 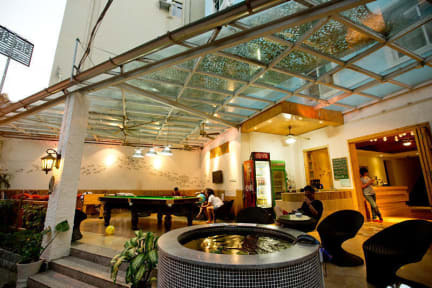 This hostel was like a 'home away from home' and likely the best hostel in Sanya! It's a place that can be whatever you want - Tom, Kathy and their team of volunteers will make you welcome, make you laugh (cheers 17, Summer, Gou etc) and help you as much as you need! Bar and lounge area has great vibe for socialising and chilling. Very near to the beach! You can help them walk their dog, Minnie, everyones best friend! Join in with evening games or just do you own thing. Would stay again! This is an outstanding hostal. I stayed there for 2 night and I really enjoyed it! Clean, super comfty beds, great location and the staff is outstanding. There is really lovely bar with CRAFT BEER! I loved it! If you travel to Sanya, just book it! You will love it. It has big lockers! 100% reomended! It was a wonderful experience, one I would happily do again! Excellent private rooms for the price. Very clean. Loved the ambience of the craft beer bar at the entrance. Some foreigners here, but definitely more of a Chinese hostel vibe. Better for socializing during peak season. Stayed in a private room, which was very good value for money, clean, and the ensuite shower had nice hot water. The staff were excellent! The breakfast was good, and they have a nice little bar, which was great for meeting other travelers, and served good value drinks and decent food. Location is dreamy, close to the beach, shops, bank and bus stop. Staff are very friendly, helpful and speak solid English. 10¥ beers. very clean rooms. The staff was very efficient and helpful. Very chill bar area! If you go big, go to ‘M2 Club’- a true hidden gem. It’s a cheap local club that was free to enter and had an intense sound system. Would stay again.. The hostel was great. Great location, great people and I loved the bar. However, I have traveled all over Europe and stayed in hostels. My experience has been people are out more than they are in. What I experienced was at least 4 bunk-mates who seemed to be there long-term. Their belongings were all over the place, and they were in their beds OFTEN. I did not feel comfortable a lot, like I was invading their spaces, and had to abide by their rules. I am an adult! Put them in separate dorms. Wonderful stay for a few days, good location for being a beach bum! Very disorganized. Check in took over 30 minutes and I was asked for the same things multiple times from different employees. Room was not clean, and it seemed that trash hadn't been taken out in several days. No blankets were provided with the bedding, so it was quite cold overnight.